The Abita Root Beer Review is the first reviewed beverage from the state of Louisiana for Handy Father. There was a real love-hate to this particular brew. It has a fairly heavy wintergreen flavor. Some describe the smell as that of soap, which is probably the wintergreen. The head and color of the Abita root beer are typical, and not bad at all. 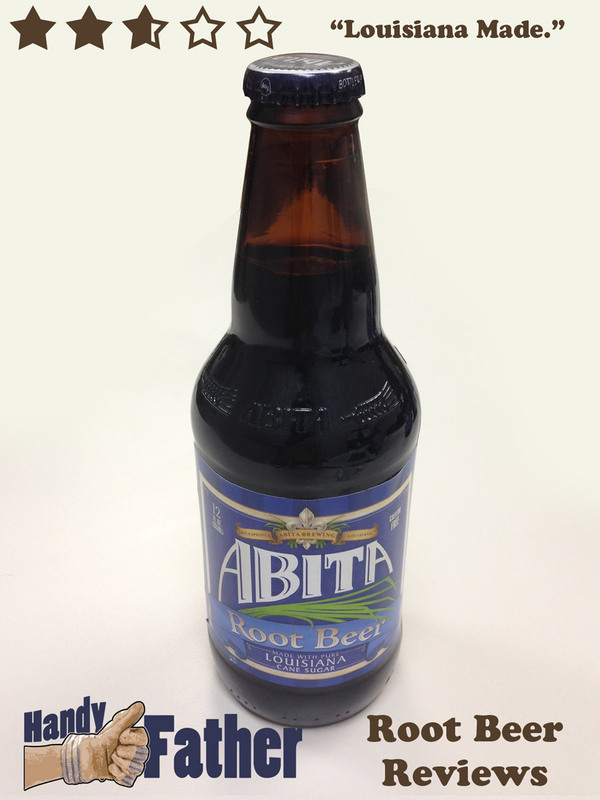 Abita Root Beer is made with pure Louisiana cane sugar, and has no additives or preservatives which is always a plus. The expiration date on the bottle was less than 2 months away, when we purchased it. That speaks of the quality ingredients. If you like a heavy wintergreen root beer flavor, then this may be your soda! We gave the Abita Root Beer Review a score of 2.75 out of 5 stars, because we had a love-hate situation between the reviewers. Don’t let the score dissuade you from giving Abita Root Beer a try, especially if you enjoy a spicy, wintergreen flavored root beer. Ingredients: Carbonated Water, Cane Sugar, Caramel Color, Root Beer Flavor, Phosphoric Acid. Abita Root Beer is brewed and bottled by the Abita Brewing Company. Abita Springs, LA. If you’d like to do a Abita Root Beer Review, leave a comment below of Tweet @HandyFather.